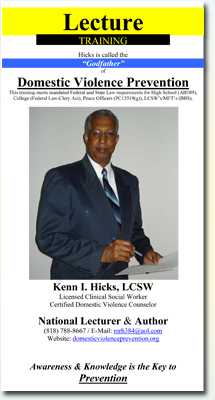 Hicks has appeared on TV, radio talk programs, lectured to the Grand Jury, and featured in many newspaper articles for his holistic approach to domestic violence prevention and teen/adult dating violence. Hicks continues to lecture at colleges/universities, county/state/government agencies, hospitals, drug/alcohol rehabiltation programs, churches, jails/prisons/detention camps, private/public agencies/organizations, etc. Click here for a list of lecture topics. Click here for a list of previous lectures & training completed. Donations and contributions are appreciated to continue free lectures. Click here to make a donation. Hicks Is Now Accepting Invitations For His National Yearly Lecture Tour Throughout the United States.